The UPS e-bike in action. Global package delivery juggernaut UPS has chosen Portland to debut its first electric-assist trike in the U.S. Using trikes and other small, pedal-powered vehicles to deliver cargo in dense urban areas is relatively common in Europe. The European Cyclists’ Federation (an EU-funded non-profit) says 25 percent of all goods could potentially be delivered bicycles. That number rises to 50 percent when just considering lightweight cargo. 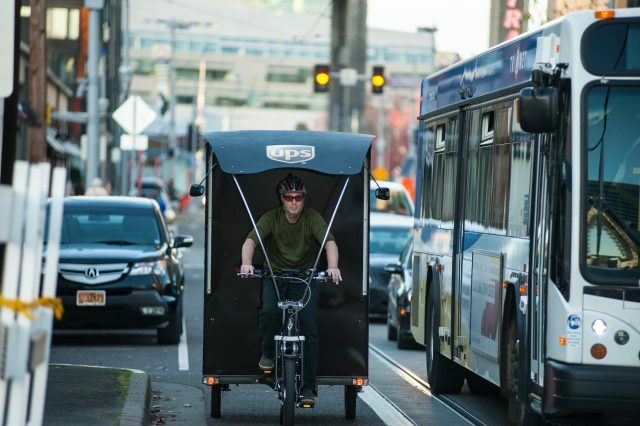 The trike being used by UPS was made locally by cargo bike innovator Bill Stites. It’s a custom version of his Truck Trike, a vehicle we predicted back in 2010 would change the shape of urban cargo delivery in cities across the globe. The Truck Trike can carry over 600 pounds of cargo plus 200 pounds of driver. 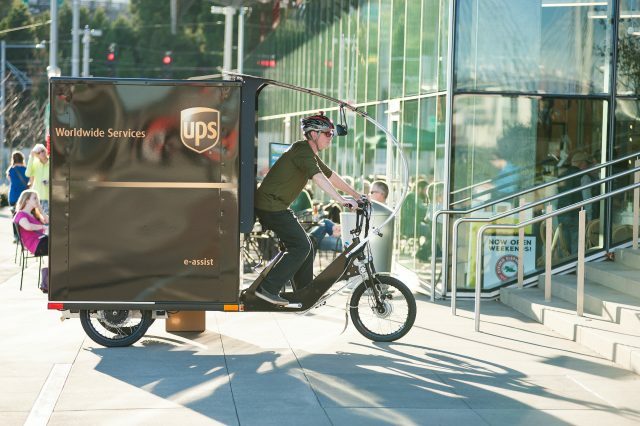 UPS started testing pedal-powered delivery vehicles in Germany in 2012. In that successful pilot, the company used a hub-and-spoke method to optimize efficiency. They placed storage containers in central locations and then had employees pick up packages by food or bike for final delivery. This type of urban freight delivery reduces emissions and congestion. It’s also similar to the concept already in use by B-Line. Last year they became the anchor tenant in a major food hub that distributes local food on the central eastside. 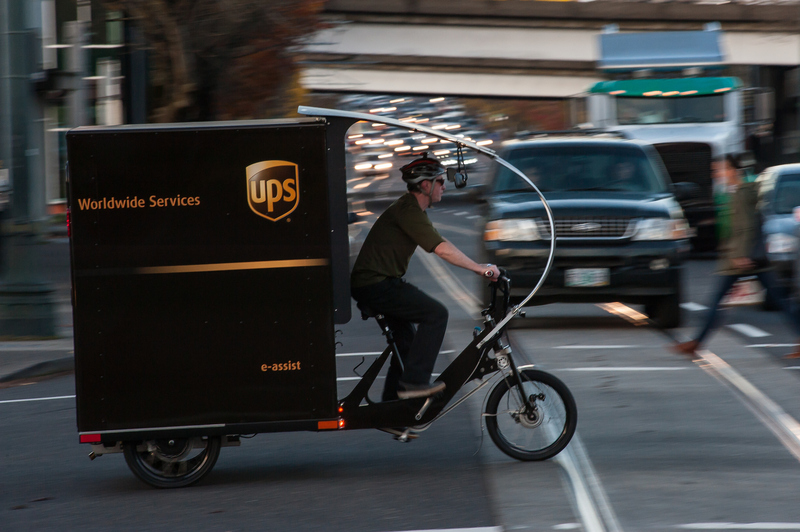 In their statement today UPS said Portland was a “logical choice” for the first U.S. deployment of an e-bike. As far back as 2008 the company has used traditional bicycles to handle deliveries during the busy holiday season. 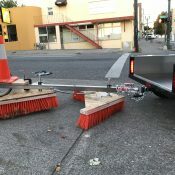 In 2011 they held a job fair in Portland and hired nearly 50 temporary bike delivery employees. UPS’s new trike will share the bike lanes with existing local pedal-powered freight delivery companies like B-Line Sustainable Urban Delivery and Portland Pedal Power — two businesses with successful track records. While congestion and air quality are definitely important, road safety is perhaps the most exciting benefit of having smaller, lighter and slower delivery vehicles. As we shared a few months ago, these trikes take the place of much larger trucks and other motor vehicles on busy city streets. They can also park on wide sidewalks, which means fewer trucks double-parked in bike lanes and more loading zones left open for others. A trike will also likely save UPS money in parking tickets. A 2006 study (PDF) in Canada found that three delivery companies (including UPS) were issued 34,000 parking tickets in just one year that amounted to about $1.5 million in fines. Jones, who has been in business since 2009, said he’s excited to see UPS enter the fray. “This is a good thing for us all. It’s a rising tide.” Jones says using trikes is far from simply a photo-op for sustainability. His business is strong and has grown each year. B-Line currently has eight cargo trikes in full-time use and six more are on the way. 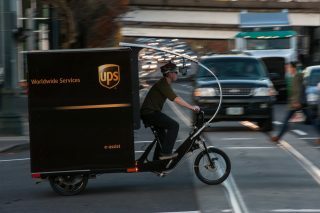 UPS says if their Portland pilot is successful they will consider adding more bikes to the fleet next year. It’s unclear whether they’d continue to use the locally-made Truck Trike or if they’d buy trikes from another vendor. This is great news. 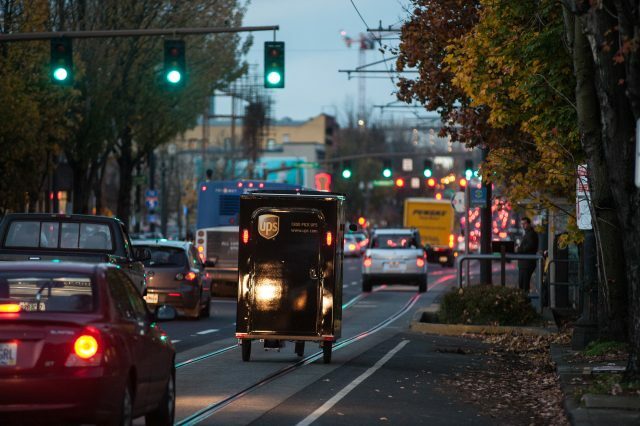 It would be even better if UPS could become an advocate for protected, dedicated bike and properly striped (and width) lanes as now it becomes a greater employee safety issue. Let’s keep the $1.5M in parking tickets in perspective though. UPS had over $48 billion in revenue last year. Although it would be great for all parties if it is zero, I’m guessing parking tickets are not on the UPS radar for expenses. Would be curious though – does the driver pay these out of pocket or the company? That 1.5 mil is spread across 3 companies, so even if 66% of that is UPS, you’re looking at 1,000,000 out of 58,000,000,000 in revenue. That’s the equivalent of a $1 parking ticket for the average Joe in one year. At that rate, they’re probably saving money by just paying the fine. Are you comparing fines and revenue over the same cities, or fines for a handful of Canadian cities vs global revenue. Ah, I read the report a little more and see now that figure is just for the city of Toronto, not all of Canada or the world. So, if we multiply that figure by 400, about the number of sizable cities there are in the world, we’re looking at the equivalent of $400 a year. Probably something they’re taking notice of, but still not crazy. Who knows, they might just throw it in with the cost of doing business. Good catch on Toronto. That’s a lot of tickets. Maybe a bigger issue for UPS and others. Or a bigger issue for cities. Trikes= less parking tickets = less parking ticket revenue? Though potentially it just frees up resources to ticket a different group keeping revenue neutral. Yes this is great step forward – I came across UPS testing one of their local e-trikes last month in the inner SE. I believe the operator said they were made by the same company that supplies B-Line. Good point about sizing of the future bikeways. Maybe in a weird way, freight could end up helping biking by pushing gov’t for wider bike lanes?! And furthermore…with such last mile delivery dependant on setting up a network of “pedal freight hubs” or “micro freight hubs”…has the CoP/ PBoT comprehensively looked at land use codes, network choke points and elevation to help set aside / or plan for where these facilities could be built / integrated into…before these prime sites are turned into boutique hotels in the Inner SE and elsewhere? Perhaps they may be a good interium use of some of our soon to be “over-built” parking garages / parkades. ‘Murica ! Very nice. The trucks are so loud from the honks before they park to just the sheer speeding. Yay! Coal powered delivery rules!! Blended coal, natural gas, wind, solar and hydro beats tar sands any day in my book. Now we need to improve that blend by phasing out the first two. 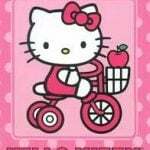 Considering that the electric motor on this bike only provides part of the energy to move it, and only part of our grid power comes from coal, I find your comment to be quite disingenuous. Boardman will cease burning coal in 2020, so I guess you will get to make ridiculous comments like this for a few more years, before they become an outright lie. Fortunately for them, lies repeated enough times become truth while ridiculous comments only grow more ridiculous over time. 75% of our electricity is from coal/gas. If you think the drivers (riders?) are actually pedaling these 600+ pound contraptions… Well, not sure what to tell ya. Sorta like the disaster relief trials – These delivery vehicles are a pointless waste of resources, attention and time. Not much in the way of details offered, here or on the manufacturer website, that I could tell, trying to load the page with dialup…as to what electric power system the cargo trike uses, but it stands to reason that it uses some variation of pedal assist technology available today. Unless the employee driver is extremely lazy, I fully imagine they’re pedaling to produce at least part of the energy required to move the rig. How much they produce, of the overall energy it takes to move the rig, may be difficult to determine, given the many variables involved. But there may actually be some dashboard equipment to keep track of the relevant data, and make calculations. On level terrain, once it’s rolling, a reasonably fit person may be able to fairly easily keep it going at 10-15 mph. Making starts from a full stop, quicker and more time efficient, is one situation where battery power probably could help. Even Downtown Portland with its relatively moderate inclines, seems to me as though it would be tough pedaling a cargo bike, especially one loaded. Out here in the downtowns and some of their close in neighborhoods. of Beaverton, Aloha, or Hillsboro, the terrain is flat, and would be much more favorable to the use of these cargo trikes. Haven’t seen the manufacturer video…but I’d like it if these trikes had really good LED lighting front and back, with turn signals and brake lights. Did you look at your own link? The giant pie chart clearly shows “22% Coal” and 26% purchased power (which would also be partially coal). Please stop spreading lies. You can sign-up for clean power and solar and vote for taxes on coal. Try a solar panel on the roof of this vs the roof of a traditional delivery truck which has been converted to electric power? I would like to know the size of this battery, it’s not anything near the 50kWh you would need to roll a big truck around all day. Fantastic! I’m glad to see UPS taking this next logical step while at the same time returning to their roots! I wonder how I’ll freight vehicles parked in and blocking the bike lane when the vehicle is a bike? Sigh, probably about the same. Or a little less mad…since a freight bike (if not pulled up into a driveway) would block 1/2 the the bikeway and not the whole bikeway. That’s great news–way to go, UPS! 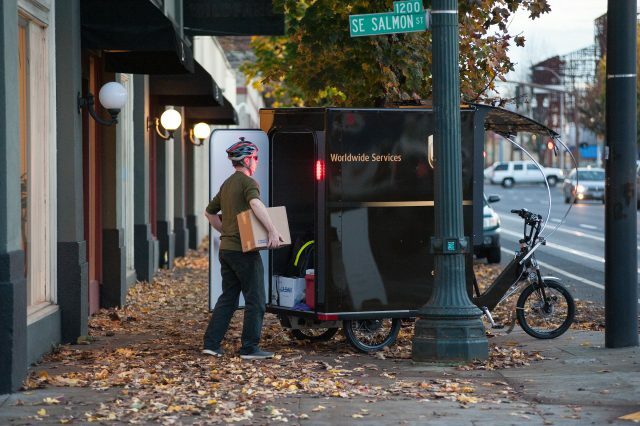 For the past four years or so UPS has been delivering packages by bicycle (just bikes with trailers) in Davis, CA. Davis, while having lots of small lots, is far from a compact urban city. It’s more of a bedroom community/suburb with a university at the edge, which shows that density is not necessary for human powered final mile to work, just like our public transit systems of a century ago show that high density is not necessary for trolleys and trains to work. This looks fun, but I suspect it is hard work. I would like to hear the delivery riders perspective. What type of training and what safety protocols does UPS offer? Since it appears the truck-trike uses a small, geared, front hub-motor I would expect it to be quite a workout. A BBSHD or other mid-drive would probably make it a piece of cake for the driver, but the added cost and complexity may make the trike unprofitable. Seems like a good way to stay warm in this frigid weather. I imagine that new versions of these bikes will be mid-drive. All of the e-assist systems seem to be moving in that direction. To provide some technical feedback: the UPS trikes have two hub motors in the rear wheels. What you see in the front is a NuVinci CVT hub. Our trikes are unique in that the human power is coursed to the front wheel. This simplifies the overall vehicle, in that we don’t need transmissions nor differentials to combine the human and electric power. Since each wheel has its own independent power source, we can easily make different sizes for the rear bed – all mating with the same front frame. This leads to a modular design that can morph into many different configurations. Without all the usual drive components in the rear [all we need to do is get electric power to the rear wheels], it allows for a lower floor, leading to lower center of gravity and more load capacity. Finally, it’s all wheel drive! Thanks Bill! Keep up the good work! Bill, that is brilliant. Actually, the product-info section of your website explains this very clearly. Sorry for the confusion! It’s about time. I would like to see FedEx, USPS and other urban delivery services follow suit. Good job UPS! Teenager with bicycle starts multi-billion dollar business. Great read. I’d be pretty interested in hearing about the operating cost to deliver with an e-cargo bike vs. a truck, for the same number of packages. 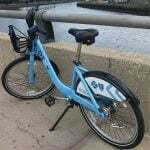 If you use multiple bikes to replace a single truck at what point does the increase in salaries cancel out the (assumed) savings in operating costs? Congratulations to Bill Stites and crew, this is a great validation of what they have been working towards for years. I hope UPS saves a lot of money, that’s what will really keep this going. And now we can start talking about how we need new freight facilities, that trick seems very effective. Hard to overstate how proud I am of Bill and team. I hope ups keeps this bike around longer than the holiday season. I’ve heard it will only be here for a short time. I was disappointed ups didn’t let me a avid cyclist and long time ups driver get a chance to use. I wonder if helmets are required? 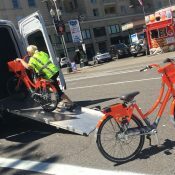 Now if Amazon would just bring in some bikes, maybe I would not keep encountering their white vans, often with motors running, parked in traffic lanes. I hope B-Line can handle the competition from such a large company providing the same service. I imagine UPS will be cheaper with better benefits provided to its employees. I support local, but does everyone else when the service is exactly the same from its competitors. When you’re a small business, you’ll do anything to lower your overhead. Maybe there’ll be a tax incentive or some other policy to incentivize the use of a small business freight company such as B-Line over UPS. This is nothing more than a political/marketing stunt. Enjoy the show.